Our Q&A with June speaker, Brittany Nico Cox, who will be talking on the topic of Craft. 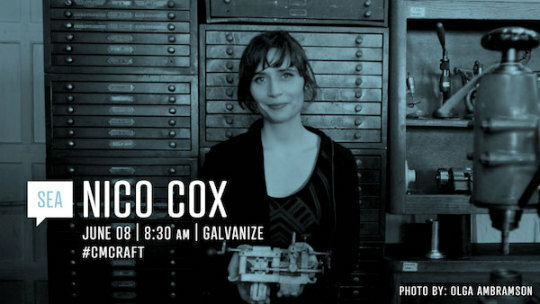 Brittany Nicole Cox is an antiquarian horologist based in Seattle, Washington. Her lifelong passion for horology has seen her through nine years in higher education where she earned her WOSTEP, CW21, and SAWTA watchmaking certifications, two clockmaking certifications, and a Masters in the Conservation of Clocks and Related Dynamic Objects from West Dean College, UK. In 2015 she opened Memoria Technica, an independent workshop where she teaches, practices guilloché, creates new pieces, and specializes in the conservation and restoration of automata, mechanical magic, mechanical music, and complicated clocks and watches. Currently, she is working on a manuscript to be published by Penguin Press. [Brittany Cox (BC)] Like inspiration, it seems to find me. It comes in the form of problem-solving, critical thinking, adaptation, and innovation. It can be an answer to a unique mechanical problem or the concept behind an automaton or optical illusion I am making. I find that it often comes in the form of a strange solution, like using blue tape on my lathe spindle to provide more tension when my lathe needs a new belt. It comes in the form of new patterns born on my rose engine or straight line machine, products of both past and modern aesthetics. It comes in hearing the voice of a singing bird I have brought back to life with a new coat of feathers, my interpretation of the bird’s song and the ancestry of its nest, a box formed of precious metals made by a craftsman two hundred years ago. [BC] I find I am most often inspired by stories. I draw on the energy of the oral tradition, which often holds truths layered in humor and tragedy. I spend much of my time surrounded by old things, which were made beautiful for the sake of beauty, though function was their main purpose. The ingenuity in those objects and how they were made with so few resources is incredibly humbling. I can see the hands of the past in them and know the intention behind their work. There is a long tradition in horology, generations of knowledge that have worked together to build beautiful things meant to inspire and invoke the sublime. I carry this inheritance, weaving the thread of lineage lost and gained into my work. The world is bound with secret knots. The mystery in that and the journey of unraveling those threads provides many splendors. [BC] Don’t be afraid of failure. You learn the most from your mistakes. [BC] Tristan Duke – holographer and light scientist. [BC] Taking on the estate of horologist Dennis E Harmon. It was a 5,000 square foot building filled with horological antiquities and hazards beyond my wildest dreams. I was 27 and a recent graduate from my studies when I agreed to sell and assess the contents in exchange for a list of equipment and supplies so that I could start my own workshop. It took me 7 months. I was surrounded by the most miraculous things I had ever seen, the machines and tools of my heritage I had only seen in books. I was often scared of losing my career and worse, my life. I found myself standing in water trying to reset electrical breakers as the roof of the workshop deteriorated and water leaked into a chemical room containing both hydroscopic and exothermic materials. I had to maneuver tanks of cyanide, pots of radium, and more. I found at times other machinists and horologists were not my allies, and that some had placed bets on my failure. I found I was much stronger than I ever thought I could be. The story is one of success, but I learned more about myself, my career, and human nature than I was previously comfortable with. Life is a strange and beautiful thing. [CM] How does your life and career compare to what you envisioned for your future when you were a sixth grader? [BC] My life is pretty much the same now as it was then. I’m not sure what I envisioned for myself. I was an entrepreneur with a roadside quartz crystal stand. I lived in strange environments I built under my bed, behind curtains, and in trees, places where I could surround myself with delicate and intricate objects. Now I basically live in my workshop, a place I built from dreams and old things, surrounded by photos of my colleagues and heroes of my heritage. When I was in sixth grade I had a collection of musical boxes, watches, compasses, and other mechanical objects. Now I spend my days restoring them for collectors and museums.